NETWORK FINALS: GRIMM gained 0.1 but SHARK TANK and the rerun of THE ORIGINALS lost the same in final numbers. CBS’s NCAA TOURNAMENT coverage adjusted to 1.5/1.8/1.8 over network primetime, from the preliminary 1.4/2.2/1.7. 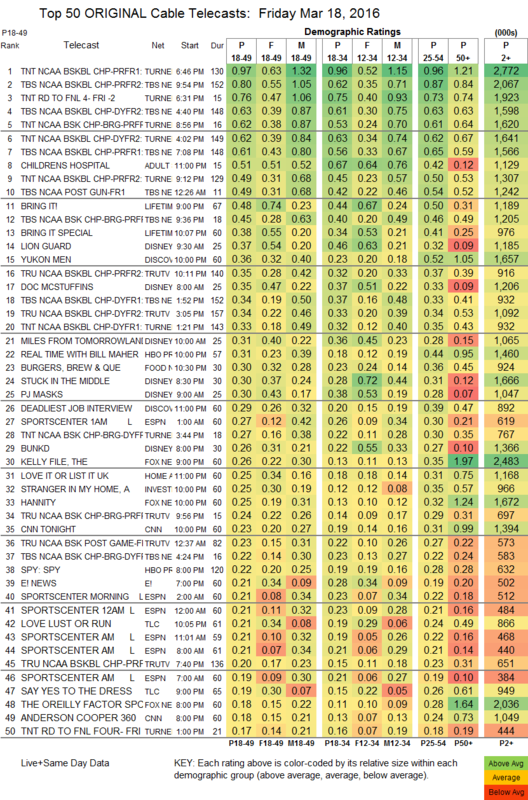 CABLE HIGHLIGHTS: The NCAA TOURNAMENT continued to dominate cable on Day 2, with games and related programming taking up 9 of the Top 10 slots (and 14 of the Top 20). Leading the pack was TNT’s primetime Pittsburgh vs. Wisconsin game at 0.97. The only non-basketball programming to hit the Top 10 was Adult Swim’s CHILDRENS HOSPITAL, down a tick from last week to 0.51. On Lifetime, BRING IT fell 0.07 to 0.48, and was followed by a related special at 0.38. Disney Channel’s 9:30AM LION GUARD scored well at 0.37, and its 8AM DOC MCSTUFFINS wasn’t far behind at 0.35. On Discovery, YUKON MEN gained a tick to 0.36, with lead-out DEADLIEST JOB INTERVIEW at 0.29. On HBO, REAL TIME WITH BILL MAHER fell 0.06 to 0.31, and ANIMALS dropped 0.04 to 0.08. Food Network’s BURGERS, BREW & QUE rose 0.05 to 0.30. 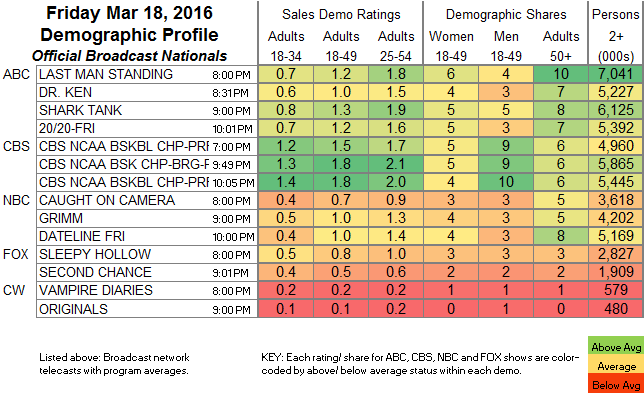 On TLC, LOVE LUST OR RUN climbed 0.06 to 0.21, and SAY YES TO THE DRESS added 0.02 to 0.19. History’s AMERICAN RESTORATION lost 0.03 to 0.16, and MILLION DOLLAR GENIUS held at 0.13. Bravo’s THE PEOPLE’S COUCH was steady at 0.15.